It’s cold outside and for some reason my brain thinks there’s nothing fun to do indoors on the weekends. Of course, my brain is always wrong. We live in a thriving metropolitan area with THE SMITHSONIAN, for pete’s sake. But what if I don’t feel like heading to The Mall (or leaving Virginia) for my art fix? Where to then? Enter, The Torpedo Factory! 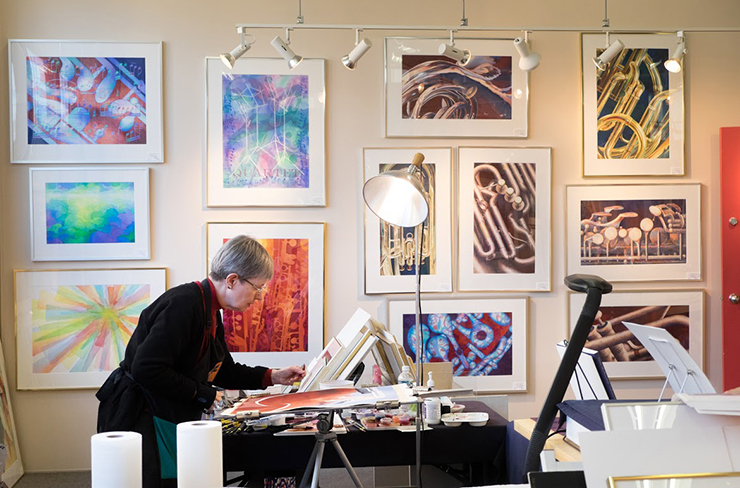 The Torpedo Factory Art Center is located on the waterfront in Alexandria, VA and is the working home to over 165 professional artists. The building is an actual defunct torpedo factory that was given new life as an art space in 1974. 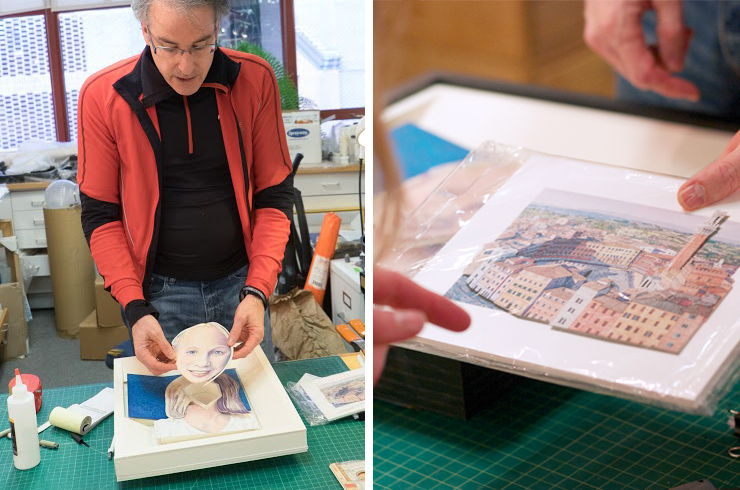 There are 82 studios that are open to the public making art accessible to everyone, unlike traditional galleries. It’s exactly this connection to the public that ignites and excites the artists working here. 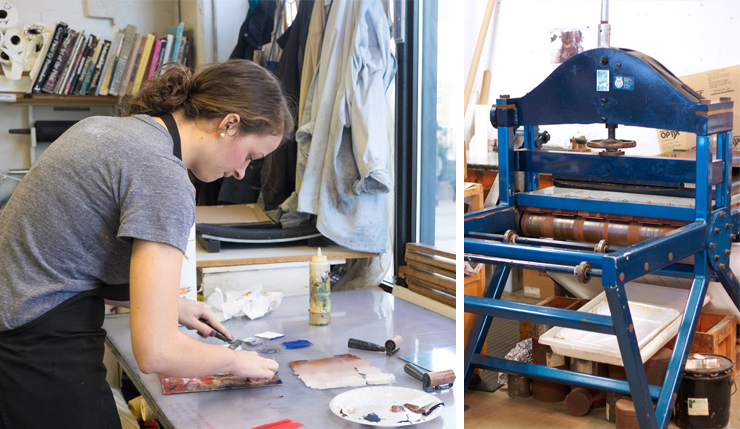 You’ll find every discipline represented at the Torpedo Factory — jewelry makers, sculptors, printmakers, photographers, painters, etc. The most fascinating aspect of this special place is the ability to speak with the artists about their process. Everyone we met was willing to stop mid-brushstroke to chat. The works were also available for sale directly from the artists. 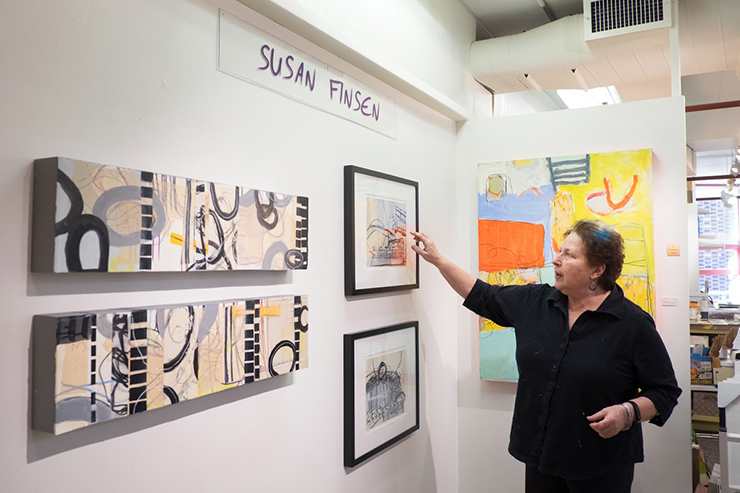 The first artist we spoke with was one of the founding Torpedo Factory artists-in-residence, Susan Finsen. Susan is an abstract expressionist painter whose works are bold, colorful and exuberant. She works with crayons, paint and collage elements to layer her marks until she finds just the right spirit. 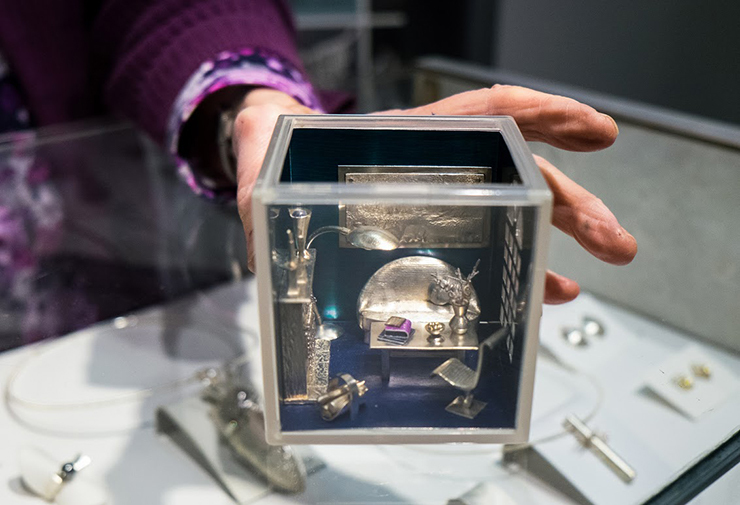 Our next stop was the studio of Swedish jewelry designer Barbro Eriksdotter Gendell. Eriksdotter is a member of Studio Metallum that consists of three designers in one studio. 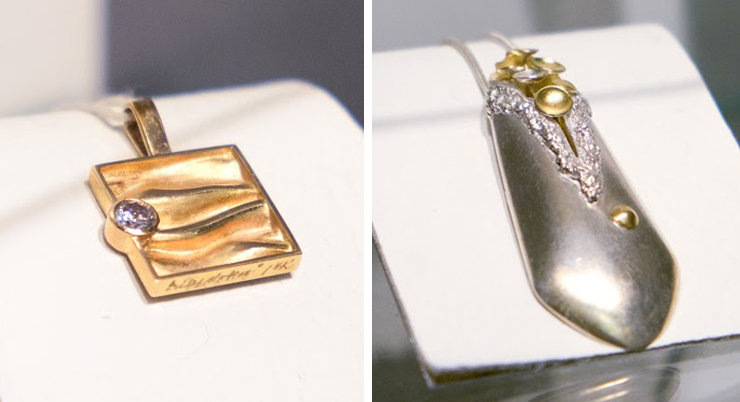 Her silver and gold jewelry is contemporary and highly original. I had never seen anything like it and truth be told, I almost walked out totally dripping in jewels! 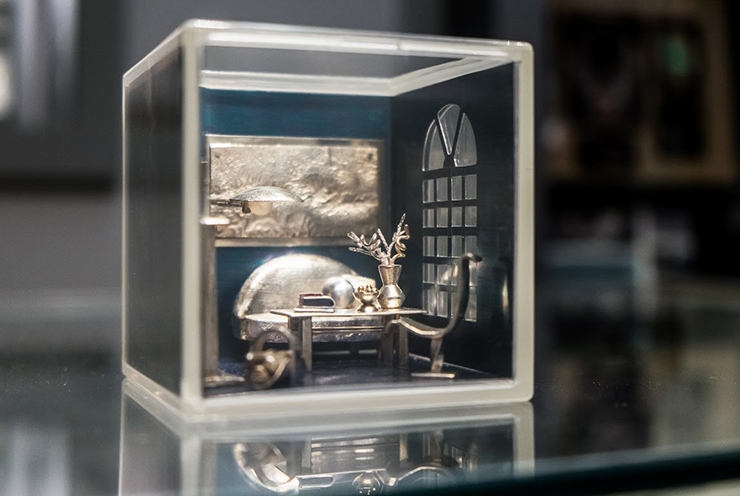 The most compelling of Eriksdotter’s works were the 3×3 inch cubes that she fashioned into rooms completely out of silver. You can see just how small and intricate these are with the artist’s hand for scale. As we were strolling blissfully through the halls, we were stopped dead in our tracks by this cute little watercolor vignette. 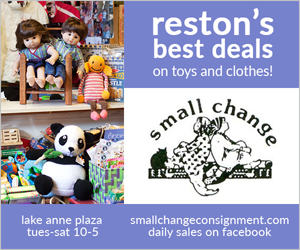 “What the… That’s Reston!” we exclaimed. We had to know more. It turns out this piece was a private commission of architect turned artist Matthew Harwood. Formerly, Harwood was the Chair of the Public Arts Committee in Del Ray, Alexandria. His unique approach to art utilizes his architect rendering and building skills to create three-dimensional portraits and scenes. The end result is a painting that seems to jump out of the frame at you. His travel series of cities around the world are particularly dramatic because of this added perspective. Harwood has also redefined the idea of “portrait” by adding this modular, puzzle-like element. 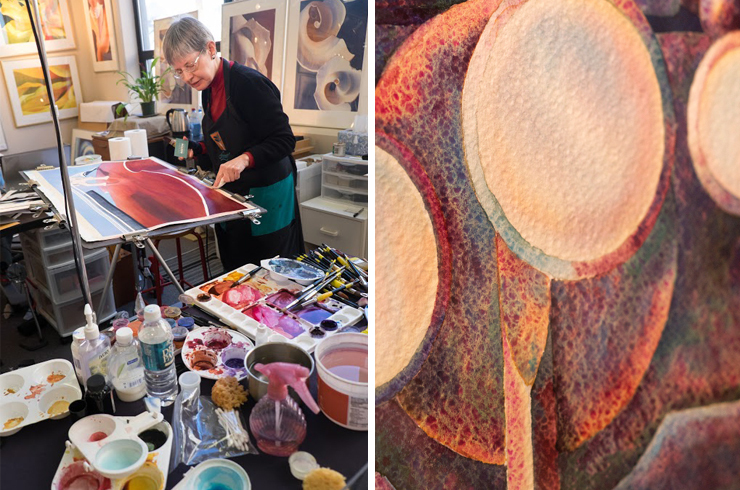 Tucked away in a beautiful, light-filled studio is watercolor artist Rachel Collins. Rachel is an accomplished Bassoonist so it makes sense that music is a pervasive thread that is woven into her artwork. The control of her medium — blending of colors, straight edges — was extremely impressive. 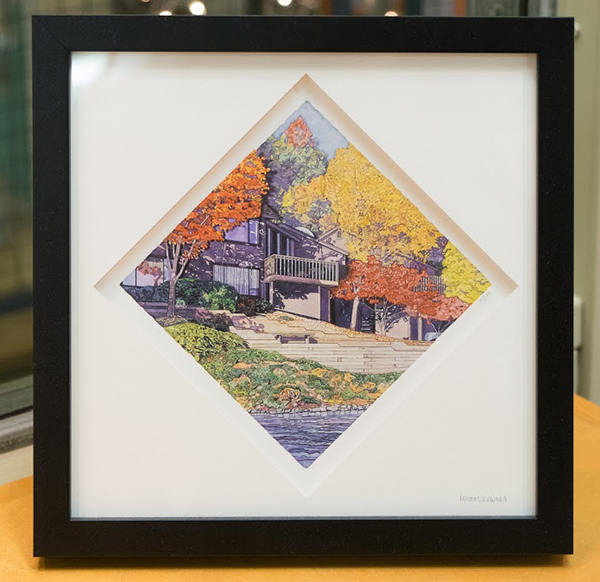 Rachel teaches watercolor classes at The Art League School (see below). If you are interested, you can find course descriptions on her website. 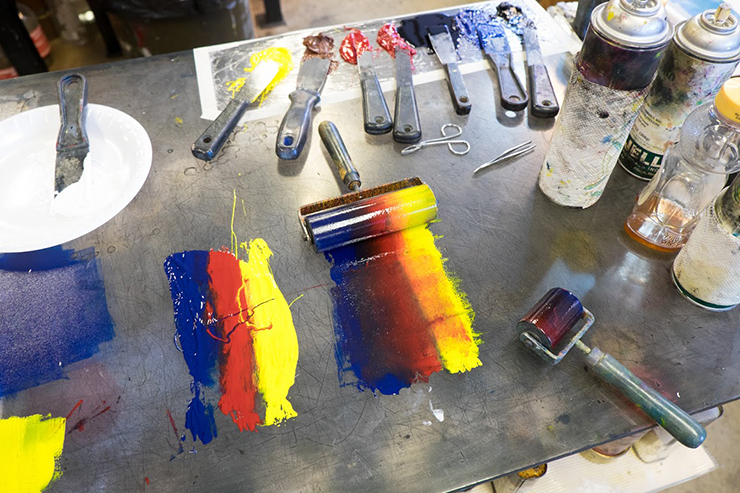 The Torpedo Factory is also home to The Art League School that offers a wide range of arts and crafts classes. Courses are offered quarterly and there are tons of options for every age from 5 years and up. 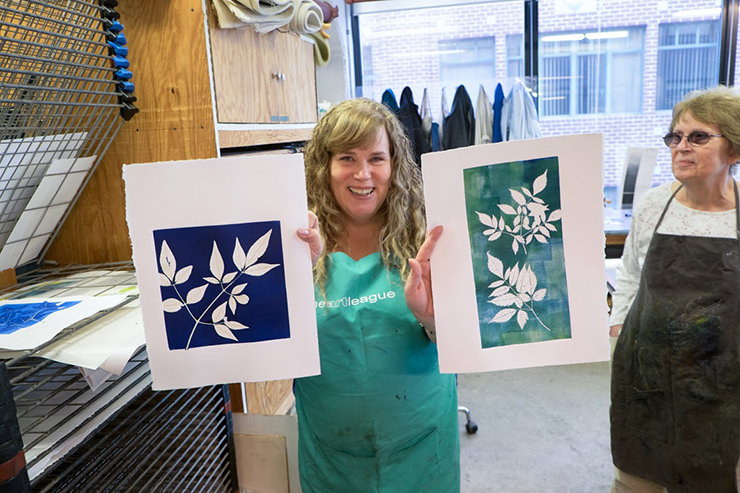 The day we were visiting, we stumbled upon a printmaking class that was gracious enough to let us poke around and snap a few pictures. 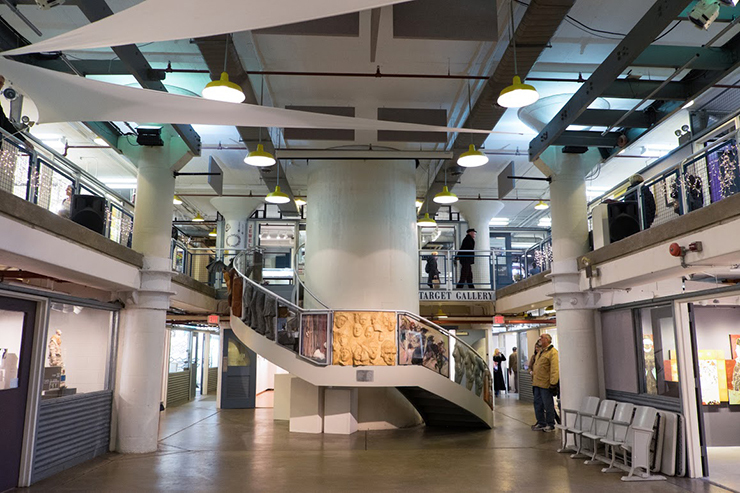 You can easily spend a whole day wandering around the Torpedo Factory. I only touched on the many, many artists working here. Next time I hope to visit the ceramicists and sculptors on our tour. There is a cafe and gift shop on the premises but a better bet would be to wander into Old Town for a leisurely lunch and glass of wine.